We are happy to introduce to you new whiteboarding features added to our virtual collaboration workplace. We’ve focused on giving you more possibilities and freedom when working with content on the board: No matter if you’re diagramming, brainstorming, developing concepts, designing flow charts or collaborating on a project. Shape library: easily structure content and ideas in a more intuitive way, customize the shapes and instantly add text. Free rotation: now you can rotate any text, shape, sticky note or image. Pin any element: prevent items from changing position by accident for a more useful organisation of your board. A floating toolbar is included to efficiently edit different board elements, and gets the job done faster. Enhanced sticky notes: no more limitation in editing your sticky notes. Customize them any way you like. The shape library provides a selection of shapes that enables you to visualize your incredible ideas and concepts. Here’s how: To add a new shape, simply click on the shape library to choose a shape. Then click into the board and draw your shape to any size you like. Once you add a new shape, a toolbar appears which allows you to quickly customize it. 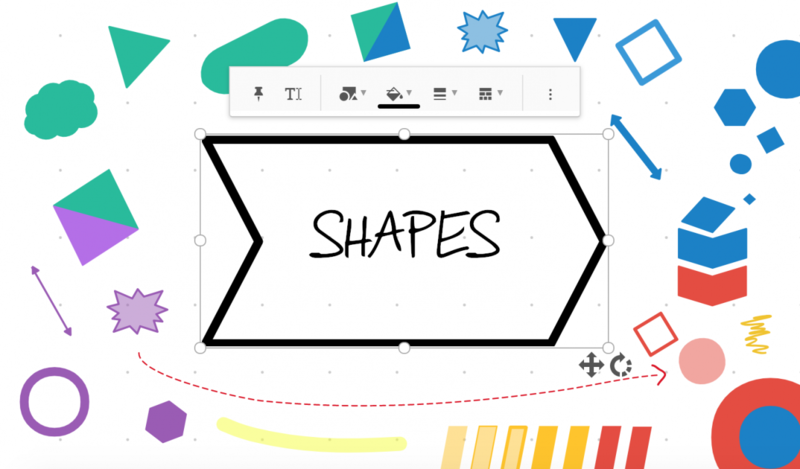 The brand new shape library contains triangles, rounded rectangles, racetracks, clouds and much more. Use chevrons and arrows to visualize processes or flow charts. Insert text for individual steps. Change the style and color of shapes to display who is responsible or to track the status. Add explosions to draw attention to critical details. Draw clouds to visualize ideas and thoughts. The whiteboarding update contains the ability to easily rotate elements. You can freely spin texts, shapes, sticky notes and images to customize and position them any way you want. Simply click on an element to display the rotation icon in the lower right corner and rotate it in either direction. It is also possible to select several elements at once and rotate them at the same time. Flip shapes with your cursor: Click the resize handle and move it to the opposite direction. The text within in the shape will keep its direction. Now you are able to pin all objects to prevent them from accidentally moving. A single click on one or multiple elements and you are free to choose whether you like them pinned or not. All items are created unpinned. However, sections are directly pinned. To select a pinned item, simply double click on it, or hold the “shift” key while clicking. The floating toolbar allows you to modify elements quickly. To access the floating toolbar, either add an element or click on an existing one on the board. Then the toolbar will appear and depending on the function that you select, various sub-functions will pop up. The floating toolbar initially shows the visual design properties for an element (background colour, border etc.). You can add and modify text by clicking on the text options. Click on the dot menu on the right side to find all action properties related to an element (e.g. delete, foreground/background, group). We have added a few enhancements to sticky notes to make them more intuitive. You can resize and rotate them as well as choose how the text should align. Go for a prominent approach by placing bold text in the middle or if you want to fit more text onto the sticky note, you might want to align the text top left. Your choice! The update also provides the feature to directly sketch onto sticky notes. Use your digital pen to visualize ideas and scribble content, instead of typing it out on your keyboard. Sketching allows for a better understanding of thoughts and concepts and thus helps to gain better results. This is not only ideal for brainstorming or ideation session, but also very helpful in early stages of marketing campaigns, for remote teams or virtual meetings. All boards are automatically updated and include the new features now. If you like to learn more about the new features, please head over to our help center or have a look at our release notes. We would appreciate your feedback. Let us know what you think of the product updates and contact us. Abraham Dunmeyer admires tech, big data, and business and is part of the Marketing team at Conceptboard. When he's not exploring Germany, you can find him on LinkedIn and Twitter. See how Conceptboard can help you leverage your team’s collaboration and communication. I have been using your tool as a personal productivity tool for over a year now. While I am not a power user (I could learn more) I have to tell you that this tool has replaced the software Smartdraw that I had a license for. I just wanted you to know that you guys are doing a great job. I feel that this software wins at being the best at being intuitive to use. That means a lot. Keep up the great work! Thank you Daniel for your awesome feedback. We appreciate you taking the time to share your experience using Conceptboard. © Copyright Conceptboard 2019. With from Germany.